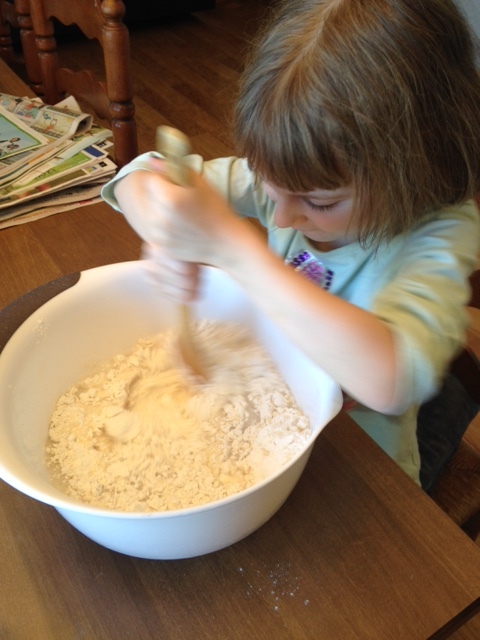 I am always looking for was to help the children celebrate the true meaning of holidays – and right now that is Easter. It’s so hard not to get wrapped up in the Easter Bunny and dyeing eggs and Peeps – and yes, we do those things and enjoy them – but I always want to take every opportunity to point my children back to the Cross. 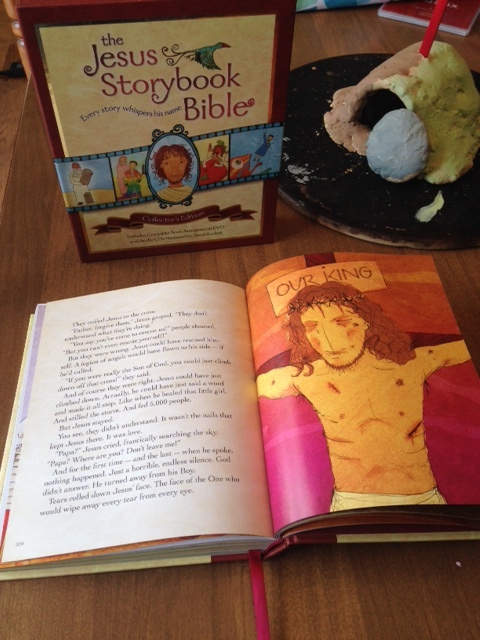 Which brings me to this amazing new story Bible we’ve been using, called “The Jesus Storybook Bible: Every Story Whispers His Name.” I ordered this off of Amazon a few months ago after hearing some great reviews, and I have not been disappointed. Daughter P literally begs to listen to the CDs in the car (we also have an accompanying DVD that she loves to watch). What is unique and awesome about this Bible is the each story points to Jesus (even the Old Testament ones) – and that is such a great reminder for us that indeed, the WHOLE Bible is about Jesus. It also teaches children that the Bible is a love letter from God to His children. It’s beautiful. I tear up a lot while reading it. 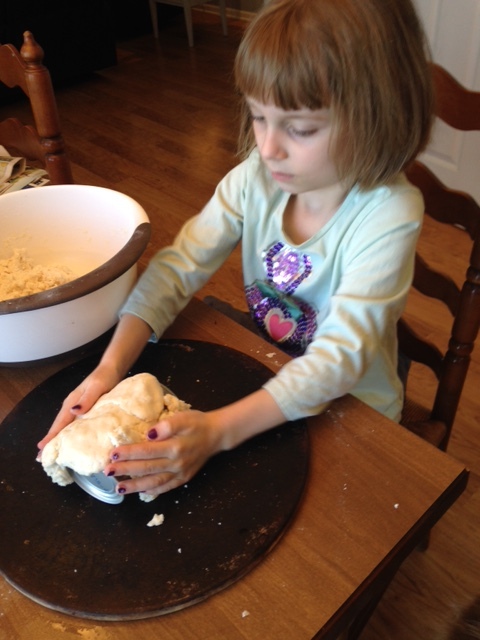 Mix and knead the playdough, adding extra water (about 1/2 cup), until it’s the right consistency. 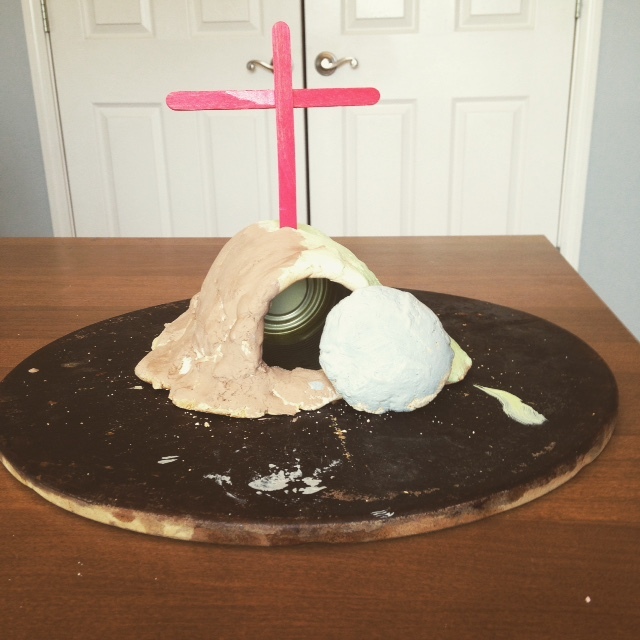 Use and aluminum can (I used a Campbell’s soup can – I emptied the soup and set it aside for lunch) to create the base of the tombstone and mold the dough around the can to create a hill. Poke a hole in the top for your cross. Bake at 350 degrees for 2 hours. Once your tomb has cooled, paint as you desire, and stick the cross in the top. On Friday, we will make a “Jesus” out of pipe cleaners, wrap him in toilet paper, stick him inside and roll the stone over our tomb. We will wait until Easter Sunday to see if he is still there!